Order your Dominican criminal background check below! Non-Dominicans who have spent a lengthy period of time in the Dominican Republic and who have subsequently returned to their home country in search of work, are asked for such proof as a matter of course. Non-Dominicans applying for residency in the Dominican Republic, who must present up-to-date proof of having no criminal record in their home country as well as in the Dominican Republic. Persons applying for employment in the DR and overseas are asked to produce proof of having no criminal record, especially if their employment involves working with children or vulnerable people. Several days later, we receive the resulting legalized document (a partial redacted copy can be seen above) which is officially referred to as a Statement of No Criminal Record, but is more commonly known as a Certificate of Good Conduct. 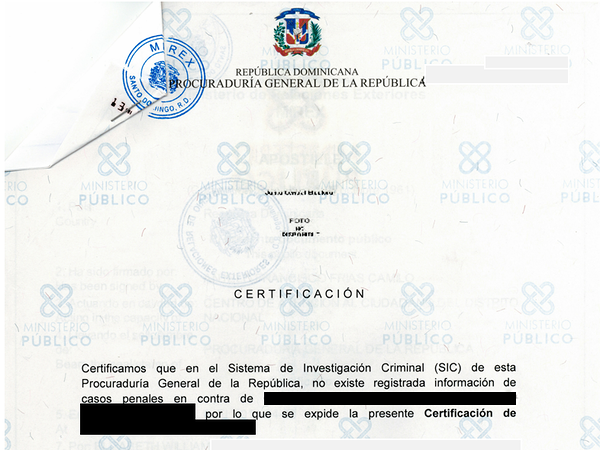 We then take your Dominican good conduct certificate to the Dominican Foreign Ministry to obtain its apostille which gives your document validity in most of the world. We mail the certificate to you via international certified airmail which takes between 10 and 35 days to arrive. The whole process takes about 2 weeks from when we receive your payment until the moment we mail it to you. * In the event that the subject does indeed have a criminal record in the Dominican Republic, the document confirms there have been criminal convictions, but does not specify their nature. Please fill out the form below, and have a credit or debit card handy to pay with. Please scan or take a good-quality photo of the page in your current valid passport which contains your photograph and personal details. (If you are Dominican, a copy of your cédula will suffice.). Your passport must still have 3 months validity left on it. BELGIANS - Dominican documents for use in Belgium must be legalized by the Belgian Embassy in Kingston, Jamaica. For US$75 we can courier your Dominican certificate to the Belgian embassy in Jamaica, but you would be responsible for paying them for their legalization, and for shipping your certificate to Belgium. We can provide their contact details. CANADIANS - The Canadian government does not consider a Dominican apostille to be final proof of your Dominican document's authenticity, therefore if your document is to be used in Canada, it must be legalized by the Canadian embassy in the Dominican Republic. We charge US$95 for the official embassy fee plus our services. Order your Dominican criminal background check now! When completing the order form below, we shall only ask for payment for the criminal background check. If you require Canadian or Belgian embassy legalisation, or a translation or express shipping, we shall charge for that once the certificate is ready.